1 – Dangerous crags along Burn O’Vat gorge will be taped using Black and Yellowtape. This will be done on all large crags on the north side and large crags on south side near control sites. 2 – Recent forest work (thinning) – the affected areas will be marked on maps in the start lanes and at registration in village hall. 3 – The weather forecast is for dry, mild and fairly settled conditions, however please still ensure you have adequate clothing to cope with February in Deeside. Remember your spare head-torch and whistle. 4 – Entries are now approximately 300 so later arrivals may need to use the overflow parking in the garage forecourt to the east of the village hall. From here cross A93 to the north side and follow the large pavement along to west to the hall as shown on the map below. 5 – Pizza van confirmed for purchase of food at the hall and CompassPoint will also be in attendance (for buying the spare torch and whistle?). 6 – The first aid team (thanks to F1 Training Services) will be based in a tent at the pre-start area. All competitors will pass this twice - before they start and after they finish. Please seek help here if you have any injuries. There will also be a small first aid kit at the Village hall for very minor issues. 7 – Course closing time is 2220. Mar Orienteering Club and Scottish Orienteering welcome you to the 2019 British Night Championships being held on Saturday 23rd February 2019 at Muir of Dinnet, Ballater. Please do not arrive before 1800. Can the Trophy-winners from 2018, please bring or arrange to have trophies brought to the race. Parking along B9158 from crossroads to bridge, please approach from the A93 and leave across the Dee bridge and B976 South Deeside Road. Parking MUST be on tarmac, not verge (estate stipulation). GR NO 459 987 to 462 982. Event helpers will be marshalling the parking, please obey instructions. Large vehicles (campervans etc) will park in the hall carpark – access from A97 to the north of crossroads. Please do not park elsewhere in Dinnet – the roads are narrow and the main road busy. See map for details of parking and route to the hall. Registration is at the village hall where competitors will pick up their emit brikke and have a spare torch and whistle checked (and, if needed, windproof jacket). There is some space for bags. Toilets – there are 2 male urinals, 1 male, 2 female & 1 disabled WCs in the hall building. There are NO toilets at the start. The 2km route between the hall and start/finish will be marked using canes with reflective tape. These are highly visible with torches. Do NOT walk along the A93. Occupants of the house near the start have been informed and are happy for competitors to pass their house. Please respect their privacy and do not relieve yourself anywhere near their property. Start at SW corner of Loch Kinord (GR 439 988). Sheltered pre-start spot by the loch, with a generator & lights. Tent for competitors to leave kit. First aid team based here. The route from finish to the pre-start area will be taped (approx 300m). The start will have a 4-minute call-up. Loose control descriptions will be available. 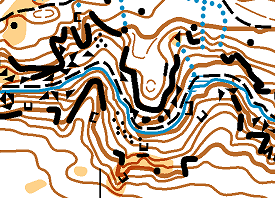 Courses stay in the forest with no controls on the higher open part of the mapped area in order to minimise the risk of hypothermia among competitors. All competitors will need to carry a second torch and whistle and may be required to carry a wind-proof jacket in bad weather conditions. The area above the 300m contour line on Cnoc Dubh hill is marked out of bounds at the request of SNH to protect endangered wildlife. This is a significant area and will not be taped off. Longer course may have legs where the line dissects this OOB area. Competitors must respect the mapped OOB and optimum route choice will never involve crossing it. There will be no advantage to crossing the area so please don’t. There are also two smaller areas of sensitive marshland that are marked as OOB on the map near the start. Lines are broken or bent around these and there is no advantage to crossing them. There are complex and abundant areas of impassable cliffs along the steep-sided slopes of the Vat gorge. These are marked with the ISOM 2017 impassable cliff symbol 201. Competitors on courses 1-4 should note this and respect that these areas are impassable and dangerous where they are clearly marked as such on the map. The gorge can be crossed safely in areas where no crags are marked. The crags will be taped with yellow and black tape - all large crags on north side and large cargs on south side near controls will be taped. Emit units are mounted on lightweight stakes approximately 80cm high. Parts of the forest are currently undergoing forestry operations (thinning) and so there will be new tractor lanes and brashings in places. The approximate area of forestry work to date will be marked on maps at registration and in start lanes. Bracken is marked on the map – mostly as undergrowth slow run as the lack of snow this winter means it has not been completely flattened. Large blocks can be used for navigation. B9119 - 20mph speed limit agreed with the council. All but one course will cross this road, some several times - please take care crossing. The road may be crossed at any point but running along the road is prohibited and anyone spotted doing this will be disqualified. Courses have been planned as much as possible to avoid an advantage being gained by running along this road. Complimentary hot drinks will be provided to competitors in the hall, apologies but soup has proved impractical due to issues with facilities in the hall. An outside caterer will be onsite providing hot meals, at present, it looks like a pizza van. Prize-giving from 21:00 onwards (as soon as class leaders decided).